On this site between 1946 and 1950 the research staff of RCA Laboratories invented the world's first electronic, monochrome- compatible, color television system. They worked with other engineers in the industry for three years to develop a national analog standard based on this system, which lasted until the transition to digital broadcasting. The plaque can be viewed in the Sarnoff Research Center, 201 Washington Rd., Princeton, New Jersey, U.S.A. The Radio Corporation of America's (RCA) color system was the only one designed to be directly compatible with monochrome broadcast transmissions and the only one that used no moving parts. Until the researchers at the RCA Laboratories took up the challenge after World War II, it appeared that the Federal Communications Commission (FCC) would approve the Columbia Broadcasting Systems (CBS) electromechanical system of color television. This was incompatible with the monochrome television system established before World War II. 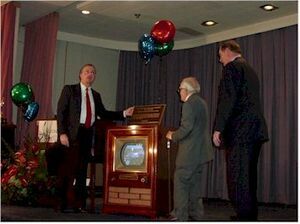 Encouraged by chief executive David Sarnoff and supported by engineers at other branches of the corporation, the staff at RCA Labs laid out the conceptual framework, established most of the principles and techniques, and demonstrated the technologies necessary for the electronic pickup, broadcast, and reception of color television in the home. This system, with contributions by other companies, became an international standard still used for analog color television. The laboratories' researchers, led by Ray D. Kell, experimented with electromechanical field sequential color systems during and shortly after the war, demonstrating such a system to the FCC in December 1945. Despite the demo’s success, Elmer Engstrom and the Labs' management realized the practical limitations of the technology in terms of picture brightness, monochrome compatibility, and scalability of the picture image. Such systems used a three-color filter on a wheel approximately three times the size of the image. To reduce flicker to an acceptable level, the wheel spun at 3600 rpm. In 1946, then, RCA committed to developing an all-electronic system designed to the same reception standards enjoyed on monochrome sets. By 1947, Kell's group had demonstrated two versions of electronic color television, the highlight of which was the use of Alda V. Bedford's principle of mixed highs. Bedford showed that the human eye could distinguish changes in brightness but not in color at high levels of detail. Therefore high-frequency components of the primary colors' red, green, and blue could be blended and carried on one of the color signals, reducing the amount of bandwidth necessary for transmission. By the end of 1948, however, technical and regulatory pressures forced the Labs' researchers to start finding ways to compress the bandwidth for color to the six megahertz (MHz) used for monochrome in the VHF section of the electromagnetic spectrum. Until then, they and the FCC had counted on broadcasting color in the UHF section, using up to 14.5 MHz per channel. Princeton staff under Dr. George Brown discovered the difficulties in using the UHF band for television in terms of both propagation and power consumption, while the growing demand for channels indicated that broadcasters would use 6 MHz allotments in UHF as an extension of VHF. (a) A brightness picture for the operation of black-and-white receivers. (b) Color information carried on a subcarrier. The subcarrier phase or relative time position was the code used to convey hue information, while the strength of the subcarrier conveyed the saturation information. (c) The frequency of the subcarrier was to be an odd multiple of one half the line scanning frequency. This was another application of the interlace principle, designed to reduce the visibility of the subcarrier in the picture displayed on monochrome receivers. This method of choosing the frequency of the subcarrier gave rise to the name "dot interlace." (d) The "mixed highs" principle to transmit the fine detail of the picture. Bedford's "mixed highs," along with Clarence Hansell's application of time-division multiplexing to color broadcast transmissions, enabled the compression of the televised signal into two components. One carried the luminance, or brightness, and the other the chrominance, or color information. A monochrome set would simply ignore the color component on the subcarrier. Receiving monochrome signals on a color receiver proved more complicated, but Harry Kihn's "Kolor Killer" circuit resolved the problem. Thus, color and monochrome receivers would be able to display, without adjustment, transmissions of monochrome and color programs. Mixed highs and multiplexing also reduced bandwidth usage so that, along with John Evans' and Randall Ballard's proposal to use dot interlacing to scan the colors, the Princeton engineers established the basis for modern analog color television. The dot sequential color system involved high-speed time-division multiplexing using a sampling frequency of 3.583125 MHz. Initially, synchronization of the sampling frequencies between the transmitter and receiver was accomplished by varying the timing of the trailing edge of the horizontal sync pulse, thereby controlling the sampling phasing and color dot interlace on a line-to-line basis. Bedford overcame the instability of this method by suggesting that a reference burst of the color sampling frequency be transmitted during the "rear porch" of the horizontal sync waveform. To reduce color fringing within the narrower transmission, Schroeder and Kell adapted quadrature- amplitude modulation to transmit a wideband orange-cyan I axis and narrowband green-purple Q axis. This provided full-color reproduction in video frequencies of less than 0.5 MHz by the Q and I axes, two-color reproduction between 0.5 and 1.5 MHz by the I axis, and monochrome detail between 1.5 MHz and 4.2 MHz. RCA announced its compatible, dot-sequential system on August 25, 1949, broadcasts of which began in September on NBC's WNBW Channel 4 in Washington, D.C.
Until then, these developments had taken place in relative obscurity at the Princeton Labs. When the FCC announced that hearings on proposed formats for color television would begin in September, however, RCA's R&D on the system commanded the attention of the government, the media, and the competition for the next eight months. During this time, despite the distractions, the Labs’ staff transmitted color broadcast signals through AT&T's 2.7 megacycle coaxial cable, conducted channel-interference tests for its own and competing systems, showed undistorted monochrome signals on a color set, and, perhaps most importantly, developed a single-cathode ray tube color receiver. During the hearings in October and November, RCA demonstrated a system that, when not suffering the effects of a heat wave, indicated the feasibility of a compatible electronic color television system. The images were not impressive compared to the improved CBS system, the weak point being the receiver. The "triniscope" used three kinescope tubes and an arrangement of mirrors to project the color image on a screen. The sheer bulk of this design required that the labs develop a more practical alternative for the home to gain approval of their system from a commission that wanted color television implemented as soon as possible. Engstrom promised the FCC that RCA would have a full-color cathode ray tube (CRT) ready in six months. This provoked a crash research and development effort, the success of which contradicted the many experts who claimed it couldn't be done. Researchers developed five versions of the single tube but all agreed that Harold B. Law's refinement of Schroeder's shadowmask tube offered the best solution. The tricolor picture tube resembled a monochrome receiver, where the screen's glow was based on the intensity of the electron beam and signal. The main difference was that the color tube contained three electron guns, one for each of the primary colors. The mask was placed next to the screen and allowed the guns to strike the screen through hundreds of thousands of perforations. Deposited on the screen were hundreds of thousands of tiny phosphor clumps, each comprised of three discrete dots. When the guns struck the appropriate dots, they emitted red, blue, and green light according to the intensity of the beam. The relative brightness of the phosphors determined the colors seen by the viewer. Over the winter, more than fifty scientists and engineers at the Princeton Labs, supported by technical and administrative staff, worked with engineers at RCA's CRT plant in Lancaster, Pennsylvania, to make a demonstration model. By the end of March, 1950, as promised, RCA showed the FCC its color picture tube in a receiver similar to those consumers bought for black-and-white television. More than any other component of the system, the shadow-mask CRT made color television a practical household technology. RCA also continued to improve camera tubes. In a studio environment, size was less of a problem. Princeton staff, led by Dr. Paul K. Weimer, borrowed from the monochrome system that he had helped invent and applied it to color. The color camera was composed of three image orthicons, the standard tube for broadcasting developed at the labs during World War II. Each image orthicon scanned an image in a primary color, treating it like a monochrome picture. The camera circuitry then blended the three primaries--red, green, and blue--and sent the image to the amplifier. RCA introduced the first commercial color camera, the TK-40, based on this design, in 1952. Weimer and his team continued to work on a single-tube color camera based on their two-inch vidicon tube, which RCA announced three years later. In July 1950, the National Bureau of Standards (NBS) reported that the RCA system demonstrated its superiority in more (12) of the eighteen categories than CBS’s line-interlaced system (9). It also offered the most "opportunity for improvement." Despite this report and the demonstrations of RCA's basic technologies and principles of electronic color-compatible television, the FCC rejected RCA's system in September 1950. (b) Color information transmitted on a subcarrier with hue information related to the phase of the subcarrier and saturation information related to the amplitude of the subcarrier. (c) The frequency of the subcarrier be an odd multiple of half the line scanning frequency. (d) The "mixed highs" principle to be applied to convey information concerning fine detail through the use of a bypassed brightness signal. The most significant contributions to RCA's system came from the Hazeltine Corporation. Hazeltine, which had a cross-licensing agreement with RCA, demonstrated to the Princeton lab researchers its concepts of constant luminance and "shunted monochrome" in April 1950. The latter resolved one of the problems of compatibility between electronic color transmission and its reception on a monochrome receiver, and was similar to an idea George Brown had frequently sketched but never patented. Constant luminance represented an extension of Bedford's mixed-highs principle to changes in brightness over time and significantly improved the picture image. On December 5, 1950, RCA demonstrated its system using what it called the "bypassed" monochrome concept which resulted in greatly reduced moiré patterns on the shadow-mask tube. RCA unveiled its final system in June 1951 at NBC’s Washington studios. A week later, RCA conducted another successful demonstration at the RCA Exhibition Hall in Manhattan, featuring Nanette Fabray. Extensive field testing using this standard began in February 1952 by several manufacturers with continued RCA support. A year later, the second NTSC published its color standard which, but for a minimal adjustment to the color subcarrier frequency, followed RCA’s lead. After RCA carried out more field tests, the NTSC forwarded this standard to the FCC in a petition on July 22, 1953. The FCC approved the standard on December 17 and it has remained in place for analog color television transmission ever since. This page was last edited on 4 April 2016, at 17:15.